I’ve discovered an alternate route to the boathouse from my neighborhood. It starts out by heading due north on the bus instead of south, leading me away from the boathouse instead of towards it, yet it gets me there almost 10 minutes faster than the other way. Does that make any sense? Of course not. But we’re talking about navigating Berlin, after all, so somehow it does. The bus takes me to Zoo Station, where I pick up the S7 instead of my old familiar S1. There’s little difference really, considering they both drop me at the Nikolassee station. The best feature of the S7 route is that it takes you through the wooded western edge of the city. The stretch between Grunewald and Nikolassee is the longest distance I’ve encountered between two stops in my trips in and around Berlin. Not that I mind stops, but it does give you the sensation that you’ve traveled a great distance when you are whisked through the woods without slowing down, as if you’re being transported to another place entirely. Last Saturday afternoon, on my way home from the boathouse, I had a bit of a tangle with an S7. It’s a decent walk from the boathouse to the S-Bahn station, at least 10 minutes, and the final stretch puts you on the road approaching the station. From that vantage point you can see and hear the trains coming. It’s hard to tell which line is approaching, but I always quicken my step when I hear the hum, even though I know it’s probably too late for me to catch it. I was in this state of hurry-yet-trying-not-to-rush as I climbed the last few steps to the S7 tracks. As I approached I saw that a train was sitting on the correct side, about to close its doors and depart. I heard the chimes signaling the doors were closing, and my heart lurched. Without a glance at the sign, I waved to the conductor and took a leap into the last train car as the doors slid shut behind me. I took a seat and caught my breath. The train was pulling away from the station. I looked out the window and did a double take. We were heading south. I had gotten on the wrong train. I’d forgotten that for some reason trains come from both directions on one side of the track at the Nikolassee station. I’ll get off at the next stop, I thought, shaking my head at myself. I looked around the train at my traveling companions, wondering whether I’d made a spectacle of myself with my mad arrival. Everyone seemed to be preoccupied. I saw among them a man passed out drunk on the seat, an open bottle of beer at his feet. His head was resting against the window and his mouth was hanging open. As we approached the Wannsee station, the announcement was longer than usual, telling all passengers to disembark; this was the end of the line. I was getting off anyway, of course. I saw everyone get up and collect their things and head for the exits. Everyone except the man passed out on the seat. I stepped off the train, one of the last to get off. I didn’t feel right leaving the man alone in the car. Next to me the conductor was locking the door to the engineer’s cabin. I stopped him, and said my usual humbling preamble, “Entschuldigung, mein Deutsch ist sehr schlecht, aber… there is a man who is still on the train. I thought you should know.” The conductor glanced in the window, looked back at me, and dismissed me with a nod. I walked up the platform, feeling better about the situation. I would feel terrible if I thought the train might be moved into a storage area and locked for days with this man trapped inside. I looked around at the signs, uncertain where my homebound train would be. The conductor walked past me with another man in uniform. The one nudged the other, pointed at me, and they both laughed as they walked toward the other end of the train. I chalked it up to my bad German. I knew it was none of my business what a drunk man did on the train, but like I said, I didn’t want his fate weighing on my conscience. I felt calm, in no rush. I looked at the station sign, painted in that eerie old script that reminds me of the war. Then suddenly I heard the chimes of the doors closing and my heart started pounding again. Something clicked in my brain. I glanced up at the sign and saw S7, and that was enough for me—I took another flying leap back onto the same train as the doors were once again sliding shut. Sure enough, the train was heading the way I’d intended to go in the first place. I sat back down, caught my breath, and shook my head at myself yet again. I don’t think I’ll ever fit in here, I thought, no matter how long I stay in Berlin. I looked out the window at the passing trees and smiled as the train gathered speed. And you know what? I’m okay with that. A few rows behind me, the drunk man shifted in his sleep. 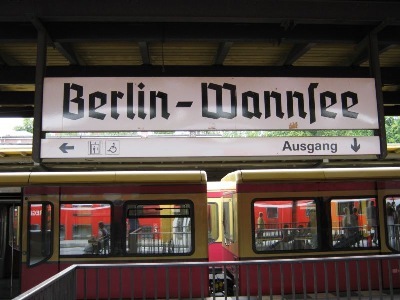 This entry was posted in Public transportation and tagged Berlin, boathouse, S-Bahn. Nikolassee, S7, Wannsee, Zoo Station on March 25, 2014 by Jill M.. I try to never rush for a bus or an S-Bahn. It is not worth it. It only gets your pulse up, you might stumble, fall, while a drunkard sleeps through the whole drama…. No doubt you’re right, Hanna. I’m just hard-wired to rush around, and I seem to have an aversion to missing trains, as if there won’t be another one for ages! It’s more of an instinct than an intent. Thanks for your comment. I like your Buddha-nature and will think of you next time I think I need to run for a train.